The mayhem and political disruption of the Trump administration and the coming midterm elections haven’t killed business on K Street this year, as health care, technology and business interests now look to action during a lame-duck session. Some of the nation’s biggest spenders on federal lobbying, such as the U.S. Chamber of Commerce and the National Association of Realtors, are on pace to exceed their tabs from last year, according to recently filed lobbying disclosures. 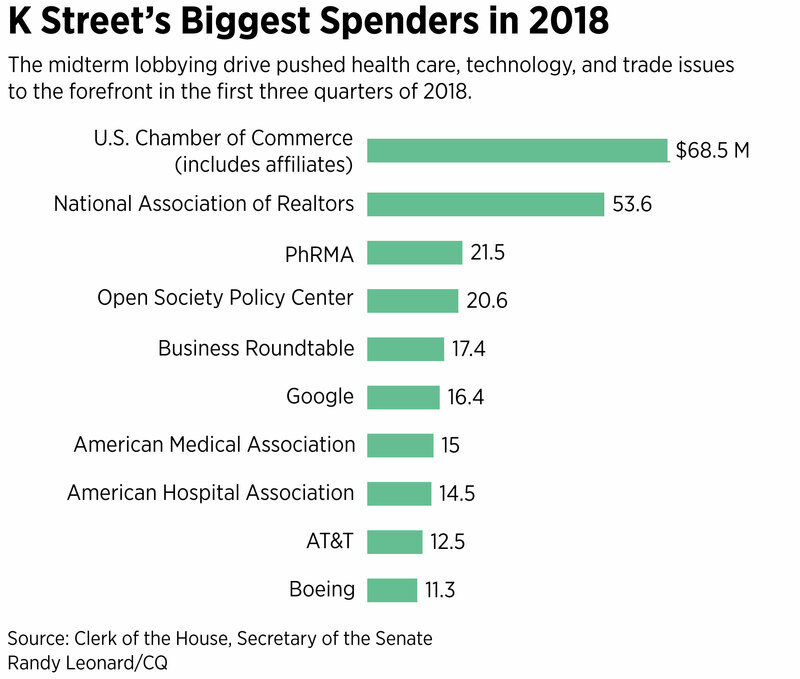 And among K Street top’s firms, some outfits reported an increase in lobbying revenue this year when compared with last year, with business fueled by passage of such measures as an opioids bill and consternation about trade policy and tariffs. “Congress is far from functioning but functioning more than it was,” said Jeff Forbes, a Democratic lobbyist who runs Forbes Tate Partners, which reported $9.6 million in federal lobbying revenue so far this year, up from $8.2 million during the same period in 2017. Tech policy, immigration, trade and data security matters have driven business at such firms as the Monument Policy Group, whose lobbying revenue was up this year to slightly less than $6 million, versus the first three quarters of last year at $5.2 million. “Our firm is heavily involved in issues around technology, immigration, health care and other hot topics, and so what we’ve seen is an acceleration in engagement from Silicon Valley to Seattle to Washington, D.C.,” said John Murray, a partner at Monument. The firm’s clients include Amazon, Boeing, the Pharmaceutical Research and Manufacturers of America and the tech policy unit of the U.S. Chamber, among others. Clients “are feeling the need to run more coalitions, more issue campaigns, more engagement in that surround-sound sense,” said Murray, a former congressional GOP aide, noting that clients want a combination of lobbying and communications strategy advice. Google remains tops in tech, spending about $16.4 million so far this year, compared with about $18 million for all of 2017. The company disclosed lobbying on matters related to regulation of online advertising, privacy, data security and a bill that would set out the federal government’s role in the safety of self-driving vehicles. Facebook reported spending $9.8 million so far this year, but its third-quarter posting of $2.8 million represented a dip from the first two quarters of this year ($3.3 million in the first and $3.7 in the second). Facebook disclosed lobbying on high-tech visas, government surveillance overhauls, tax, trade, privacy legislation and a bill to regulate online election ads. Though business interests dominate K Street spending, some ideological groups also show up, including the liberal-leaning Open Society Policy Center, with $20.6 million in spending for the first nine months of 2018. The National Rifle Association, the best-known lobbying group in support of gun rights, increased its investment in federal lobbying in the third quarter to $2.1 million; the other two quarters combined were $1.8 million. The gun group did not respond to a request for comment, but disclosed lobbying on numerous bills in the third quarter including a measure from Republican Sen. Marco Rubio of Florida that would roll back firearms prohibitions in Washington, D.C. The Realtors’ lobby spent $53.6 million in the first three quarters of this year, nearly equaling its entire 2017 budget, which was $54.5 million in a year when it was in the throes of debate over the tax cut package. The Realtors include state-level and grassroots advocacy in its federal lobbying reports, even though such spending isn’t required, the group’s president, Elizabeth Mendenhall, said in a statement. “The increase in third quarter expenses is a result of the approaching 2018 midterms elections, as Realtors continue to support candidates based on positions and voting records that indicate support for homeownership and real estate investment,” Mendenhall added. On Capitol Hill, she said, recent issues included a reauthorization of the Federal Aviation Administration, water infrastructure matters, and the renegotiation of the North American Free Trade Agreement. Brownstein Hyatt Farber Schreck also reported a surge in federal lobbying revenue — reporting fees of $22.6 million for this year’s first three quarters versus last year’s first nine months with $20.8 million. Republican lobbyist Marc Lampkin, managing partner of Brownstein’s D.C. office, says his firm’s bipartisan roster of lobbyists has been a magnet for clients. The shop has former aides to Senate Majority Leader Mitch McConnell of Kentucky and House Minority Leader Nancy Pelosi, as well as tax policy experts Russ Sullivan, a former staff director of the Senate Finance Committee, and Harold Hancock, a onetime tax counsel on the House Ways and Means Committee. They joined in June. “That instantly gave us huge credibility being a national tax policy practice,” Lampkin said. Even though the tax overhaul got through Congress in 2017, the lobbying over its implementation and various consequences continues. Lobbyists say clients are eagerly assessing what the midterm elections will mean for Congress’ lame-duck agenda and, more importantly, for the new 116th Congress. In the remaining months of this year, Lampkin and other K Streeters said, federal budget issues will dominate, as lawmakers must wrap up a spending deal to fund much of the government beyond Dec. 7. One fight that may overshadow that debate will be over President Donald Trump’s border wall. Forbes said he’s telling clients to expect a lot of debate in the lame duck but “everyone needs to prepare” for Congress to punt on government funding with a continuing resolution to February.